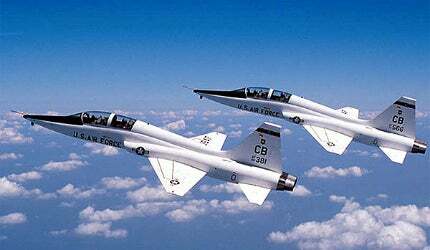 The T-38 Talon is the US Air Force's primary supersonic jet trainer. More than 500 T-38s are in service with the USAF. USAF T-38s are being upgraded with new avionics and modified engines. The T-38 is used primarily by Air Education and Training Command for undergraduate pilot and pilot instructor training. More than 60,000 USAF pilots have trained in the T-38 since it entered service in 1961. The T-38 was the world's first supersonic jet trainer. Pacer Classic is a programme designed to extend the structural life of the T-38 to 2020. Northrop Grumman has built 1,187 T-38 twin-jet trainer aircraft and more than 60,000 USAF pilots have trained in the T-38 since it entered service in 1961, when it was the world’s first supersonic trainer. More than 500 remained in service with the US Air Force and National Aeronautics and Space Administration (Nasa) and it is also in service with the armed forces of Germany (40 aircraft), South Korea (30), Taiwan (40) and Turkey (69). Hawker Beechcraft formally announced plans for the next spiral development of the successful T-6 platform into the AT-6B aircraft. USAF T-38 trainers are primarily used by the Air Education and Training Command for joint specialised undergraduate pilot training (JSUPT), but the aircraft are also used by the Air Combat Command for its companion training programme and by the Air Force Materiel Command to test experimental equipment. Nasa uses T-38 aircraft as trainers for astronauts and as observers and chase planes on programmes, such as the space shuttle. Pilots from Nato countries are also trained on the T-38 at the Sheppard Air Force Base, Texas, through the Euro-Nato joint jet pilot training programme. The T-38A is a basic supersonic trainer aircraft and the AT-38B is the lead-in fighter trainer fitted with a centreline weapons station for practice bomb dispenser. A programme to upgrade the T-38A and extend the service life of the aircraft until 2020 is underway. The programme includes new avionics and propulsion and new structural elements including the wings. The upgraded aircraft is designated T-38C. The USAF T-38As were upgraded to T-38C by upgrading the avionics and support systems. In May 2008, the USAF temporarily grounded its fleet of the T-38C aircraft, following two fatal crashes in May and April 2008. The crashes were found to be unrelated. The aircraft is a low wing monoplane with a fuselage of semi-monocoque design constructed mainly of aluminum with steel and titanium. The cantilever all-metal tail has a hydraulically powered rudder and single piece all moving tail plane. The aluminum alloy multispar wings are fitted with heavy metal plate machined skins. As part of the US Air Force’s Pacer Classic programme, initiated in 1984, the structural integrity work on the T-38 includes replacement of the ejection seats, longerons, landing gear and brakes, flight controls and an impact resistant canopy. In May 2011, Pacer Classic III was proposed to enhance the service life of T-38 aircraft up to 2020. A total of 125 aircraft were chosen in this phase. The air force initiated a T-38 wing life improvement programme in 1997 and in 2001 Northrop Grumman was awarded a $3.2m contract to develop a newly designed wing incorporating fatigue resistant aluminum alloys. Northrop Grumman has developed the new wing to augment the aircraft’s service span up to 2020. "Nasa uses T-38 aircraft as trainers for astronauts and as observers and chase planes on programmes, such as the space shuttle." The tandem cockpits are air conditioned and pressurised. The cockpits have separate manually operated canopies, both jettisonable and rearward hinged. The cockpits, separated by a windshield, are equipped with rocket-powered ejection seats. The instructor’s seat in the rear cockpit is raised by 25cm to give a clear forward view. The instructor and student pilot have a Magnavox (now Raytheon) AN/ARC-34X radio communications set operating at UHF and an Andrea AN/AIC-18 internal communications system. The navigation suite includes a Hoffman AN/ARN-65 TACAN (tactical air navigation) system and a Bendix compass unit. The aircraft is fitted with a Hazeltine AN/AP-64 IFF information friend or foe transponder and a Rockwell Collins AN/ARN-58 ILS instrument landing system. Boeing was awarded a $45.6m contract in 1996 and a $9.4m contract in 2002 to design, develop and implement the T-38 avionics upgrade for the United States Air Force under the USAF propulsion modernisation programme. Israel Aircraft Industries was selected as a major subcontractor. "The United States Air Force awarded a ten-year contract worth $601m to General Electric Aircraft Engines to modify the J85-5 turbojet engines." The first T-38C aircraft upgraded as part of the avionics upgrade programme (AUP) was delivered in July 2002 and more than 200 aircraft of the 500 contracted have been delivered. In February 2010, Advanced Simulation Technology (ASTi) supplied 39 Telestra 4 systems to Boeing for upgrading the T-38 avionics. The aircraft are being fitted with an avionics suite by Honeywell Military Avionics and are also being equipped with head-down displays, electronic displays, control panels and instruments in both cockpits and a head-up display in the forward cockpit. The navigation system has been upgraded with the installation of an H-764G integrated global positioning system and inertial navigation system (GPS/INS), L-3 Avionics Systems RT-1634(V) TACAN (tactical airborne navigation systems), radar altimeter, yaw damping stability augmentation, an air data computer and a traffic collision avoidance system (TCAS). The aircraft is equipped with two General Electric J85-GE-5 turbojet engines, each rated at 2,680lb without afterburn and 3,850lb with afterburn. There are three fuselage bladder tanks and a dorsal bladder tank, with a total capacity of 2,206l of usable fuel. A single refuelling point is located on the lower fuselage. Each engine is fed by a separate and independent fuel system, with the centre and aft fuselage tanks for the port engine and the forward fuselage tank and dorsal tank for the starboard engine. The USAF has undertaken a propulsion modernisation programme which supports the T-38 Talon advanced trainer to 2040. The major elements of the modernisation are an engine modification programme and an avionics upgrade programme. The United States Air Force awarded a ten-year contract worth $601m to General Electric Aircraft Engines to modify the J85-5 turbojet engines on the fleet of 509 aircraft. The contract included the delivery of 1,202 J85-5 modification kits and 509 engine ejector nozzles. The first aircraft, with the engine upgrade, was delivered in November 2002.